5 Bedroom Detached House For Sale in Leicester for Guide Price £1,600,000. 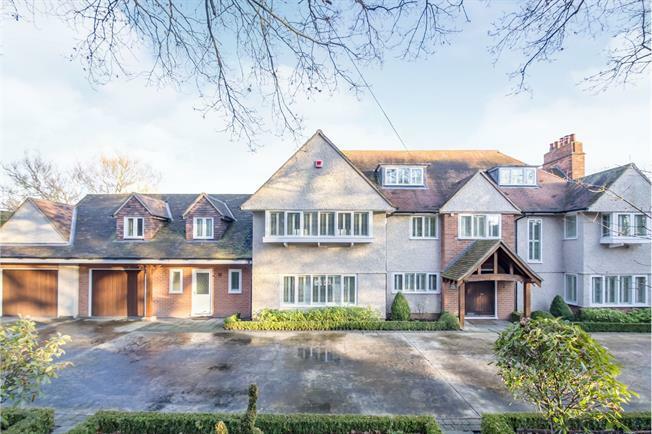 The Oaks is a lavishly appointed five bedroom property which sits on approximately half an acre of landscaped grounds and having open aspect views to the rear. The home is approached via electric gates to an in and out driveway and shaded by two mature Oaks trees. The internal accommodation comprises entrance hall, lounge, family room, a stunning kitchen diner with sitting area which overlooks the attractive rear garden, ground floor shower room and utility room which leads to the integral double garage. On the first are four double bedrooms, two with en suites and a family shower room. The master bedroom has the luxury of a separate dressing room located on the upper floor. On the second floor is a fifth double bedroom. Adjoined and accessed from the rear are two spacious rooms previously used as offices which are located above the garage. To the rear of this charming property is a generous size well maintained landscaped garden. There is a recently built gymnasium in the garden which is air conditioned and offers a multitude of uses. The Oaks is an exciting opportunity for the purchaser to acquire a significant property in one of Leicestershire's most highly regarded locations.